Cafes offer most of what Marta and I need to be happy and productive: good espresso, good food and sweets, and a reliable internet connection for working afterwards. So, if we get to a city where there are cafes everywhere, we’re much more inclined to loving it. Enter George Town, Penang – the city of a seemingly-endless list of events and things to do, and an even longer list of cafes to visit. So how do you know which ones are worth your limited time in Penang? Well, we’ve visited the lovely city twice now and have done the research for you. Here’s our shortlist of the best cafes in George Town! Of all the cafes on this list, Mugshot has the strongest claim to the hipster crown, if there were one. It has plants growing all throughout, old film cameras on display inside a glass casing, a huge bowl full of beta fish that looks like it was taken from a large garden, a circular brick oven in the middle of it all (seen above), and weathered wood adorning it all, from the tables to the walls to the chairs. This place has character, is all. Mugshot serves the typical range of espresso-based drinks and, in conjunction with the bakery that is connected to the cafe, a handful of pastries, bagels and croissant sandwiches. The cafe has an open feel to it, including its several rooms and small outdoor seating area, which makes it easy to relax or work in. Check it out! Wheeler's Coffee is the place we've visited the most on this list – it could be because of the amazing food, the dependably-fast wifi connection we've desperately needed at times for work, or just that it was the first restaurant that caught our attention when we arrived to George Town. The fact is, as much as we love coffee, we'd continue visiting bicycle-themed Wheeler’s Coffee even if they didn't serve coffee. Which is to say, we really enjoy eating here. But if you don't go for the food or their coffee, do pass by for the vintage bike decor and the cup-art throughout the cafe, and for the live music on Wed., Fri., and Sat. nights. Indoor seating isn't always guaranteed, as it seems that people like air conditioning amidst oppressively-hot, Malaysian afternoons – but there’s always an outdoor- and upstairs-seating area. Try this: Espresso Chicken, followed by Carrot Cake. 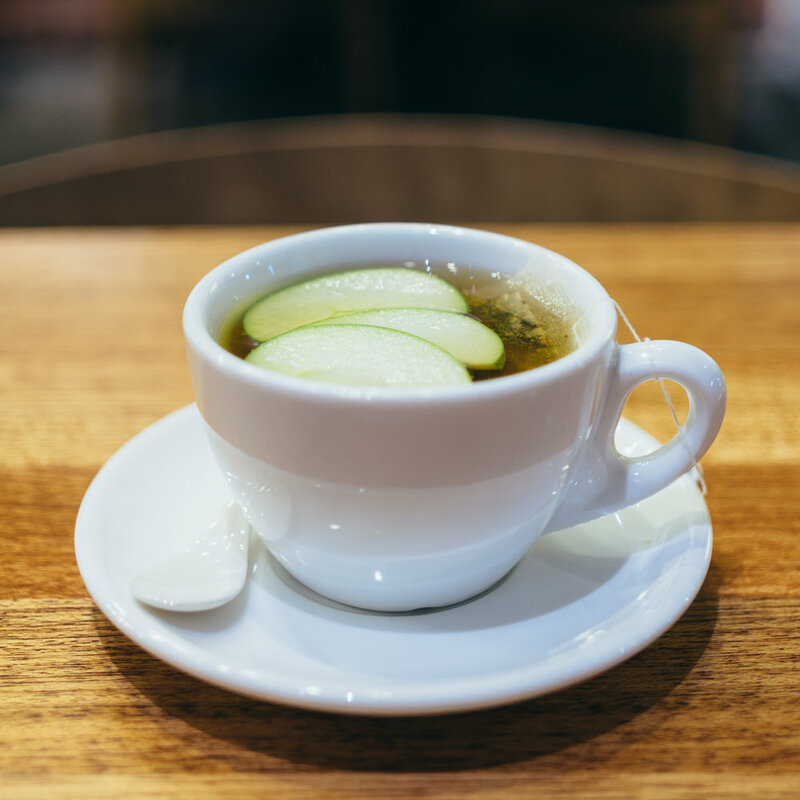 Also, the Apple Cinnamon Detox Tea (pictured above!). You visit Black Kettle for the modern, relaxing, and spacious aesthetic and end up leaving with bags of scones and tarts and cakes and all sorts of other sweets. Black Kettle is a beautiful cafe/restaurant that is captivating due to its minimalist styling, its various baked treats and goods, and its great location on Beach Street. We should also mention that they serve a varied menu of meals here that consist of brunch items, salads, chicken/steak/salmon plates, and pasta, among others. The highlight of this place, however, are the breads, pastries, and other exquisite baked goods that Black Kettle has to offer. We initially discovered The Twelve Cups on one of our walks through George Town. The ambiance and window-lit, white decor caught our attention, while the crepe cakes were what forced us to stay for just a few more minutes. This cafe is like most others in that it also offers a great selection of food and sweets (most notably the crepe cakes), as well as offering the usual espresso-based drinks and coffees. Their selection of meals is relatively smaller, but filled with delicious entrees that consist mostly of brunch items and pasta. The Alley isn’t quite as charming as the other cafes on this list, nor is it as big. However, it makes up in size with its famous churros (and who doesn’t love those?) and its strong coffee. You could sum up this cafe in one word: cozy. The lighting is also more subdued than the other cafes on this list – less window lighting and more florescent light bouncing off reflective white walls. It’s the kind of place you could spend hours at with good company and nice cup of coffee or tea. And of course, churros. So, while you might not come here for the gorgeous Instagram or Facebook photo, it’s definitely the place to go to get away from the noisy world outside and spend some quality time with a friend or two. Try this: This probably goes without saying, but a large order of Churros with Salted Caramel and Chocolate. We hope this list helps you on your visit to George Town, Penang. Are there any cafes that you think should be on the list that didn’t make it? Let us know in the comments!